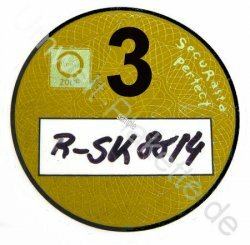 Germany tax inspection 3 - $20.00 : Bob Hoyts Classic Inspection Stickers, Add a Final Touch to your Restoration! This Germany sticker was restored and reproduced directly from our original. This sticker apparantly is a tax inspection sticker for use somewhere in Germany. We believe it is placed on any year or model car and the price depends on how old the car is. This sticker is for classic restoration and not to be used for current registration. The hand written numbers on the front can be changed for an additional $10.00. Click on "antique license plate number" and we will hand print the number you ask for. Hopefully someone can provide us with other German stickers.